My wife Peggy and I have our favorite restaurants, but our absolute favorite is Pacific Grill. Located in downtown Tacoma, parking is a problem, but Pacific Grill offers valet parking starting at five in the evening. 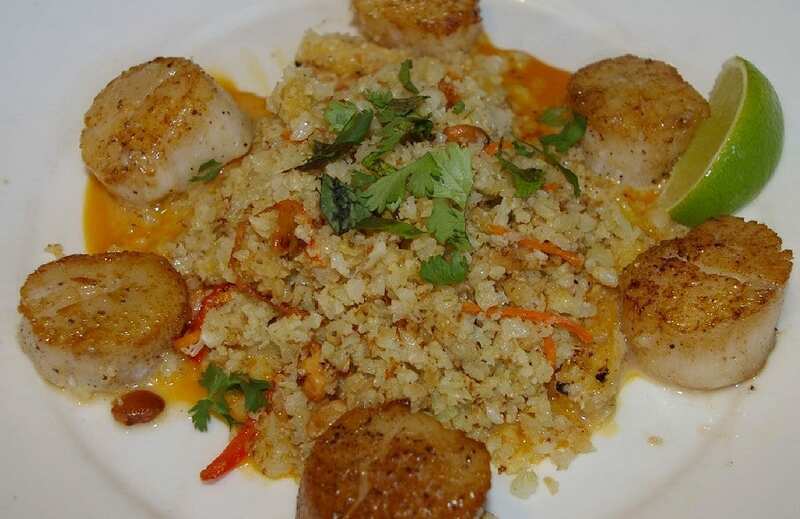 The dinner only comes with four scallops, but you can order additional to share. If we plan in advance, which is best, we always ask for Diane or Danielle as our server in our reservation request. After our last visit we’ve added Gabriel to that list. He was so kind to our two granddaughters (ages 12 and 14) who accompanied us as he carefully explained several dishes to them and praised their choices. A good restaurant should leave you with pleasant memories of both the food and the service. That doesn’t always mean expensive. For example, on our last trip to Ocean Shores we wrote about The Fabulous Lost Restaurant of Cosmopolis – www.nwadventures.us/Clarks-2017.html – which provided inexpensive food, good service, and great food. With Pacific Grill, we have our favorite items. They do change their menu with the season, which is both good and bad. We could eat their steelhead lox appetizer at every meal, but currently it is not available. However, the change in menu brings new favorites in season. The parsnip soup was fantastic. We can hardly wait for its return. Peg’s youngest sister lives in upstate New York and misses our Pacific wild-caught salmon. But, note also the two extra scallops on her plate. Peg almost always orders the Scallops – sautéed day boat scallops, cauliflower ‘rice’ with grilled pineapple, vegetables, cashews, trinity herbs plus passion fruit-fresno chili sauce. These are not the tiny fingernail bay scallops, but rather the ones that are silver dollar size. My cousin Chuck from Arizona joined us for dinner at Pacific Grill. Peg gave him one of her scallops. It was cooked to perfection. Chuck had one bite and said, “So that’s what they’re supposed to taste like.” He would fry them on both sides and then turn them on edge and roll them in the pan so they were all brown . . . and over-cooked. Scallops should never be chewy. In the picture of Peg’s scallop dinner you’ll see six scallops. The dinner only comes with four, but you can order additional to share. One of my favorite meals is the Filet Mignon – grilled 8oz certified angus filet mignon, potato gratin with Manchego cheese and smoked Gouda, green beans and red wine sauce. An excellent meal of course, but I always order two scallops, also. That way Peg doesn’t have to give me one of her’s. However, I still share a bite or two of my beef. 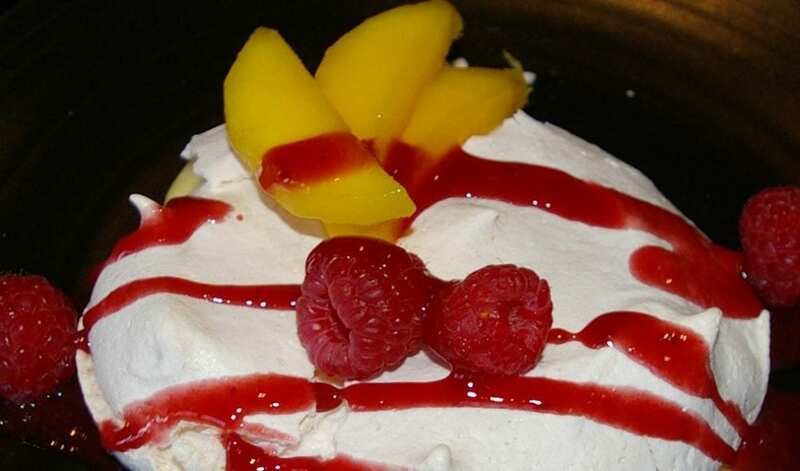 I’ve twice now ordered the Raspberry Mango Pavlova – featuring a ginger meringue with mango curd, fresh raspberries, and mango and raspberry coulis. Peg’s youngest sister joined us for dinner while she visited in July. She lives in upstate New York, and misses Pacific wild-caught salmon. Mostly what she sees back east is farm raised Atlantic salmon. 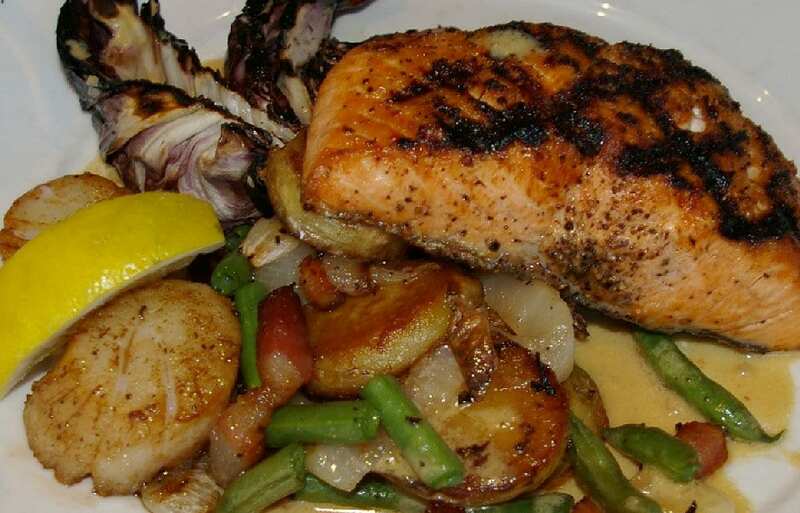 So at Pacific Grill she ordered the Wild King Salmon – fresh grilled wild king salmon, crispy Yukon gold potatoes, green beans, grilled radicchio and Walla Walla sweet onions, Nueske’s applewood-smoked bacon plus Dijon mustard vinaigrette. Again, note the two extra scallops on the plate. The vegetables and sauces served with the meals also are top drawer and excellent. A high quality restaurant should have good in-season fresh veggies as well as sauces you would like to spoon into your mouth, but don’t. Really. For dessert Peg has been ordering the Peach Cornmeal Cake – fresh peaches, whipped vanilla bean crème fraîche, toasted pistachio with caramel sauce. When she first had it, her eyes just glowed, so of course I asked Diane to prepare an order “to go.” Peg ate it the next day. I’ve twice now ordered the Raspberry Mango Pavlova – featuring a ginger meringue with mango curd, fresh raspberries, and mango and raspberry coulis (koo-LEE). A coulis is a thick sauce of pureed fruits. You usually see it as a smear on the plate or added to the top. The pavlova is named after Russian ballerina Anna Pavlova. The meringue has a crisp crust and is soft and airy inside. When the raspberries are all gone, the pavlova will probably disappear as well. Each trip to Pacific Grill is an adventure, but you’ll be glad you came. Your parking/valet fee will be added to your bill and the valet will be notified to retrieve your car from parking, so you only need pick up your keys from him when you leave the restaurant. Or they might be in your car and ready to go.